Across each clef there are measures. A MEASURE is bound by the vertical bar line that goes across the staff. In a measure there can be quarter notes, eighth notes, sixteenth notes, and even thirty second notes. The QUARTER NOTE usually gets one beat in a measure. 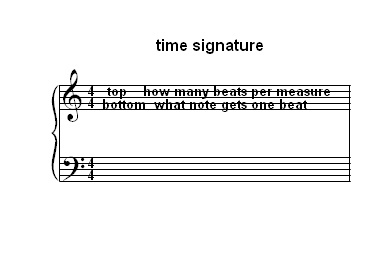 Many time signatures have 4 beats per measure. Then 4 quarter notes are in each measure. The eighth note is half the length of the quarter note. The sixteenth note is half the length of the eighth note. The half note is twice as long as the quarter note. The whole note takes up the entire length of the measure. The TIME SIGNATURE is the fraction that you see. It may look like 4/4. The TOP number tells you how many beats are in a measure. The BOTTOM number tells you what note gets one beat. There are 4 beats per measure and a quarter note gets one beat. In 3/4 time there are 3 beats per measure and a quarter note gets one beat. In 6/8 time there are 6 beats to a measure and the eighth note gets one beat. This can be 6 short beats or it can sound like two groups of 3 notes. Then it sounds like two long beats with three notes in each beat. One long beat with 123 notes and another long beat with 123 notes. Notations for where there is no note played called RESTS. There is the quarter rest, the eighth rest, sixteenth rest, and the longer rests of the half rest, and the whole rest. As two eighth notes equal one quarter note, you will see two eighth notes in the same position of the one quarter note. 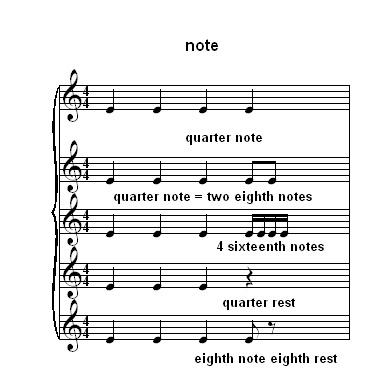 Two or more eighth notes are usually connected together with a line called a beam. The quarter rest tells you not to play a note for one beat. You do not play a note on the last beat of the measure. The eighth rest tells you not to play a note for an eighth note duration or half of a beat. If you have 3 quarter notes and an eighth note followed by an eighth rest you play the eigth note for half the duration of the last beat and then you do not play for the last part of the beat. If you have an eighth note followed by an eighth rest on the first beat and followed by three quarter notes you play the eighth note for half the duration of the first beat and then you do not play for the last part of the first beat. Then you play the 3 quarter notes. It will sound like a short note followed by three longer notes. A SHARP(#) raises the note a half step up from the note played. If you play C and you see a sharp then you go up a half step to the black key to C#. A FLAT(b) lowers the note a half step. If you play D and you see a flat, then you go down a half step to the black note from D to Db. You can see the C# and Db are the same note. A natural sign in a measure takes off the sharp or flat from a note for the duration of that measure. 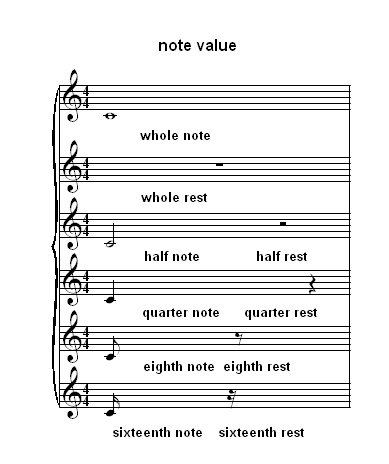 A dot in front of a note increases the length of a note by half of the notes value. A quarter note with a dot would increase its length by an eighth note. Remember that 6/8 time can sound like two long beats where 3 notes are played. Beatles Best 2nd Edition For Easy Piano It has 318 pages. You can get a shorter version of a Beatles Easy Piano songbook First 50 Songs by the Beatles You Should Play on the Piano It has 160 pages.